Looking for deals in Doha? Located in the heart of a dynamic capital, Four Seasons Hotel Doha offers luxurious accommodations with its own private beach and exclusive marina. Everything was perfect. Frozen grapes by the pool, wonderful staff who knew our names, lovely room, outstanding facilities. Nestled in the heart of the historic Souq Waqif and just 15 minutes from Doha International Airport, Souq Waqif Boutique Hotels is a collection of 9 historic buildings featuring intricate décor and... I made reservation for one room but they upgraded me to a wonderful suite in nearby branch of the same hotel chain in Souq Waqif area. The suite was fabulous with great amenities. The location is wonderful especially for people who like to see local traditional Qatari life. The staff were very friendly and professional. My reservation did not include breakfast, but the breakfast menu there was excellent and very reasonably priced. Located in an island at The Pearl- Qatar, Marsa Malaz Kempinski, The Pearl - Doha offers a private beach, outdoor pools and a Spa by Clarins. My stay at Marsa Malaz Kempinski was magical. Just 15 minutes’ drive to Doha International Airport, Kingsgate Hotel offers spacious rooms with a kitchenette and free Wi-Fi. It has a 24-hour front desk and a breakfast buffet restaurant. Our experienced since we started checking in to Kingsgate Hotel was consistent outstanding. Located on a private beach overlooking the Arabian Gulf, this Marriott hotel is just over 8.1 mi from the Hamad International Airport. Room rates vis a vis services and facilities are good and justified. Nestled on the shores of the Arabian Sea, the Ritz-Carlton resort features a world-class spa, modern fitness center and elegant restaurants and bars. Perfect hotel,perfect staff. Thank you. Featuring free WiFi, Sapphire Plaza Hotel offers deluxe 4 star accommodations in Doha. Guests can enjoy the on-site restaurant. Free private parking is available on site. The room was spacious,the cleaning was each day. Located a 14-minute walk from Souq Waqif, Golden Tulip Doha Hotel in Doha offers a fitness center and garden. Calm and hospitable staff,like Emma,Nacism,Micheal and Jeff of security. Hotel Cigale offers luxury accommodations with free WiFi, a wellness center with 6 treatment rooms. It is a 30-minute drive from Hamad International Airport. The Hotel has a great location, in the middle of Doha. You have several Services Besides the hotel. Located on its own private beach, the InterContinental Doha Hotel offers 5-star luxury in the West Bay area of Doha. I reallly love our room, Felt so relaxed during the stay. This 5-star hotel features a private beach area, an outdoor swimming pool, and tennis courts. All air-conditioned rooms have views of the Arabian Gulf and private marble bathrooms. The ambiance and the facilities were great, edpecially the Olympic size pool and the gym. Towering 50 stories over the fashionable West Bay district, Shangri-La Hotel, Doha is located in the heart of Qatar’s commercial and financial center with easy access to the business and diplomatic... The room was large and comfortable, the bed especially so. What are the best hotels in Doha near Doha Airport? Travelers who stayed in Doha near Doha Airport (DOH) have said good things about Oryx Airport Hotel -Transit Only, Doha Marriott Hotel, and Oryx Rotana. How much is a hotel in Doha for this weekend? The average price per night for a 3-star hotel in Doha this weekend is € 102.99 or, for a 4-star hotel, € 136.83. Looking for something even fancier? 5-star hotels in Doha for this weekend cost around € 356.05 per night, on average (based on Booking.com prices). Which neighborhood is the best one to stay at in Doha? Corniche, West Bay, and The Pearl are popular with other travelers visiting Doha. Which hotels in Doha have nice views? Four Seasons Hotel Doha, Marsa Malaz Kempinski, The Pearl, and The Ritz-Carlton, Doha got great room view-related reviews from travelers in Doha. Which hotels are the best ones to stay at in Doha? Souq Waqif Boutique Hotels - Tivoli, Al Najada Doha Hotel by Tivoli, and Zubarah Hotel are some of the popular hotels in Doha. How much does it cost to stay in a hotel in Doha? On average, 3-star hotels in Doha cost € 45.15 per night, and 4-star hotels in Doha are € 58.59 per night. If you're looking for something really special, a 5-star hotel in Doha can be found for € 167.70 per night, on average (based on Booking.com prices). Which hotels in Doha offer an especially good breakfast? For hotels in Doha that serve highly-rated breakfasts, try Four Seasons Hotel Doha, The Ritz-Carlton, Doha, and Al Najada Doha Hotel by Tivoli. How much is a hotel in Doha for tonight? On average, it costs € 57.80 per night to book a 3-star hotel in Doha for tonight. You'll pay around € 78.45 if you choose to stay in a 4-star hotel tonight, while a 5-star hotel in Doha will cost around € 201.27, on average (based on Booking.com prices). Which hotels in Doha are good for couples? These hotels in Doha are highly rated by couples: Al Najada Doha Hotel by Tivoli, Holiday Inn - Doha - The Business Park, and Zubarah Hotel. What are the best hotels in Doha near Souq Waqif? Some of the best hotels in Doha near Souq Waqif include Al Najada Doha Hotel by Tivoli, Souq Waqif Boutique Hotels - Tivoli and Golden Tulip Doha Hotel. Which hotels in Doha are good for families? Many families visiting Doha loved staying at Al Najada Doha Hotel by Tivoli, The Torch Doha, and City Centre Rotana Doha. 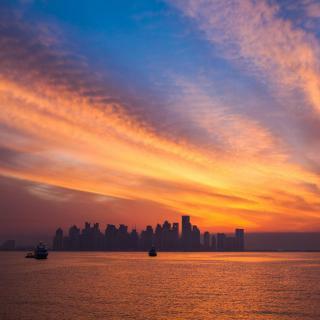 The ultra-modern Doha is best known for its busy airport, impressive skyline and stunning waterfront. With plenty of newly built sports facilities, large shopping venues and growing commercial centers, Doha is a true representative of the fast-developing Qatar. From its old souqs (open-air markets) to new shopping malls, Doha is home to half of Qatar’s population. Pearl Qatar, which is a commercial, residential, recreational and tourist complex, reflects the vibrant expansion and growth of the city. A highlight of Doha is Al-Corniche, a long seaside promenade that curves around Doha Bay offering stunning views of Palm Tree Island and the city's skyscrapers. 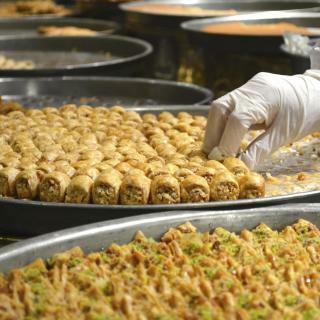 Due to the population diversity, a large variety of cuisines are available ranging from Indian to Italian, American and, of course, Middle Eastern. For travelers wanting an alcoholic drink, alcohol is only available in bars attached to international hotels. 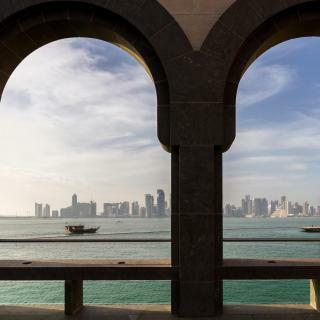 Perched on a stand-alone island, The Museum of Islamic Art is a showpiece of the world’s most complete collection of Islamic artifacts, and the first of its kind in the Gulf area. For day excursions, Doha Zoo features a variety of animals, including the Oryx, Qatar's national animal. Aladdin's Kingdom is an amusement park located in the West Bay. Booking.com has a variety of self-contained apartments, luxurious hotels and resorts, overlooking the picturesque Gulf and near Doha International Airport. 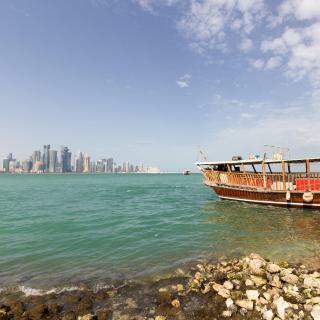 For a tourist visit, there isn't much to do in Doha for more than just a few days. Honestly one could see all the sights in one day. There are some fun things to do at the beach and in the desert though too. Interesting place to visit if you have a long lay-over. 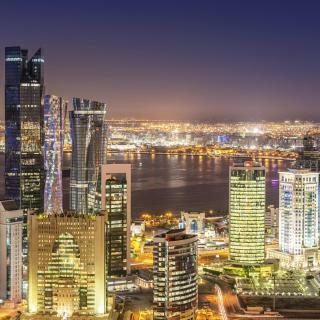 Doha is an evolving city even though it is already very well developed. It has many attractions including Islamic history and culture, parklands, and shopping - both modern malls and souks. The marina is an interesting place, too. Public transport is not fully developed yet. However, it should be alright by 2020. Katara village is an interesting place to visit. Best way to get around in the city and to places such as Katara is by booking a private tour with a tour operator. Their drivers/guides are quite good at making the most of your time. Desert tours are worth trying. Had a pleasant stY in Millenium Hotel Doha because of good service and cleanliness. However, we had bad experience with two taxi drivers. First one took us to diff. Souk in spite of telling him where to go. It took him to bring us to correct place 1.5 hours resulting in us missing the night city tour . We are aware of traffic but we felt driver took a roundabout way, and so cost became higher. Second driver did not have a meter and was charging us QR 30 from Villagio to hotel. But we disputed it and said it was too much. He settled for QR 20. Happy with desert safari sand bashing ride. Doha it's just okay for a few days, during summer it's way to hot to be outdoors. During winter is amazing, nice weather, ride to the dessert, walk or seat by corniche or Mia park. Food is good and quite cheap, super easy to go from one place to another with uber or Karwa taxis. Although traffic is bad! EXCELLENT STAY , EVERYBODY IS FRIENDLY , VERY SECURED, FOOD EXCELLENT EVEN FOR CHILDREN LOT OF FUN WITH THE ICE CREAM SELLER IN THE SOUQ.. SHOPPING IS A MUST , VISIT THE SOUQ..IF YOU TRAVEL VIA QATAR AIRWAYS ALWAYS TRY TO STAY FOR AT LEAST ONE NIGHT ONE DAY IN QATAR ,, FREE VISA FOR US CITIZEN.. THE ONLY PROBLEM IS THE TAXI DRIVERS , THEY ARE LOST COULD NOT FIND THE AIRPORT !!.. WE EXPERIENCED MORE THAN ONE TIME THIS PROBLEM.. MUST OF THEM DO NOT SPEAK ENGLISH .. BETTER TO HAVE YOUR DESTINATION WRITTEN IN ARABIC.. THEY DRIVE YOU AROUND AND AROUND..
LOVELY COUNTRY TO VISIT. THEY HAVE MADE ENTRY VISA IS SO SIMPLE THAT YOU DON'T NEED TO WORRY ABOUT LOT OF DOCUMENTATION, AIRPORT AUTHORITY HELP AT THEIR BEST, TRAVELLING ARE VERY EASY, EASY TO FIND THE ADDRESSES. The room is very big and well appointed. Bathroom is huge as well. Buffet breakfast is good. The hotel has a club with live band where drinking alcohol is unrestricted. Great location. It is a few minutes walk to the Islamic Art Museum, Souq Waqif, and the seaside promenade that has the best view of West Bay’s skyline. A shuttle service to and from the airport is provided by the hotel. The gentleman who checked us in. I forgot his name but if i do look out for a hospitality proffessional than its him. I haved lived in Malaysia for few years and I can definitely tell he represents Malaysian hospitality truely as this hotel is a Malaysian chain of hotels... I have lived in Holiday Villa in Malaysia as well and i felt like being back in Malaysia with his hospitality. While hotels in that category do not always “deliver the goods”, the Millenium Doha definitely did: great decor, spacious room, immaculate bathroom... However, the top mark goes to the human element, notably the performance of the incredibly friendly and competent young person at check-in. The process was smooth and painless, with all questions expertly and promptly answered. It’s a new hotel, everything seems that you are a first user of it. I liked the interior decoration of the room with beautiful design and colors. Very comfy bed. The location is perfect, in the center of Doha and near to every thing. The room is fully equipped with all you need, 40” flat screen, iron, kettle, small fridge, hair dryer and toiletries. Very friendly staff. The room includes big sized TV, very big bed, full kitchen stuff, refridgerator, microwave, electric kettle, cooking surface and full set of kitchenware, which is not available in most hotels in this price. The hotel has very nice outdoor swimming pool and gym. The pool has 2 days a week for ladies only for privacy. All staff are very friendly and helpful. One of the most beautiful hotels in Doha, Qatar that everyone must try to experience. Hotel's perfect ambience, awesome crews & speedy service. What else can u ask for? Very nice boss Mr Wael. Thank you for the great service. The hotel's location was easily located, just behind the street of famous hotels. The rooms and bathrooms were clean and comfortable. Air conditioner, TV etc. all were working properly. The staff were exceptional, a central and interesting location, with great collaboration of services with the other Tivoli hotels in the Souk. I have been in 4 hotels in Doha. So far , with regards to customer service and location, La villa palace hotel is number 1 for me. Thumbs up! Best location! Best view! New hotel! Very clean! Very clean rooms! Very friendly staff! Everything was excellent! One of the best hotels in Qatar! Very friendly staff especially F. ZAHRA :) Thank you! Attention to details for the guest's comfort, cleanliness, spacious rooms, amazing bed. Free water. Great food in all restaurants.